Sweet red strawberry knickers, perfect for bedtime on a summers night or wearing at the seaside on the ice-cream run. Our ruched knicker style is lightly elasticated for a comfy fit. 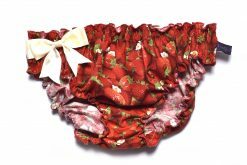 Trimmed with a satin bow- choose from cream or red. *Made to order item. Please allow 5-7 days for us to make and send your knickers. 100% mid-weight cotton. Machine wash. Try our classic Dreamers style- based on a traditional ladies brief with good coverage, you stay looking pretty with our cute range of cotton prints. Lightly ruched with softest elastic, they really are a dream to wear. 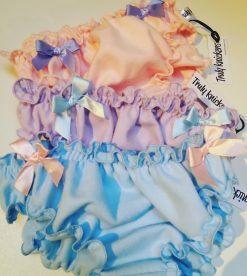 We decorate each knicker with a satin bow, choose from the colour options for an individual look. Made in 100% cotton, they wash a dream in your machine.